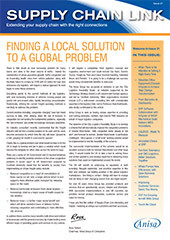 The most recent issue of Supply Chain Link is now available to download. This issue examines how improving your customer service can save you money when managing your Supply Chain more effectively - one of the key trends that the company is currently addressing with its CALIDUS Online Portal. Also featured is TomTom Telematics and OBS Logistics’ VEhub mobile app for vehicle and driver document management,now available for the TomTom827x series.